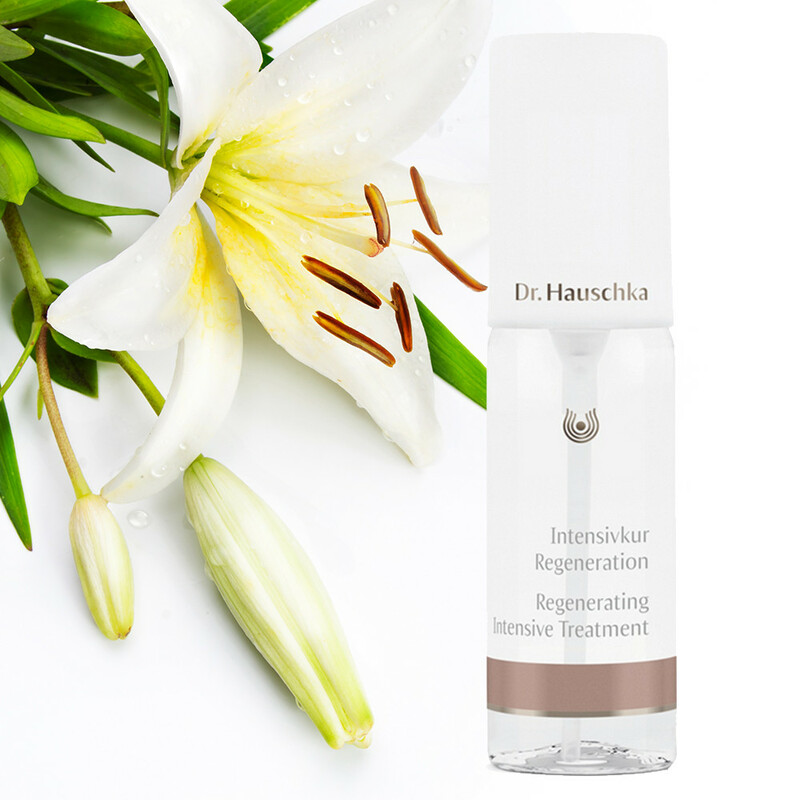 Regenerating Intensive Treatment has been specially designed for maturing skin that has lost its natural balance and needs specific care; focusing on wrinkles and dryness. In addition to your daily skincare routine skin also benefits from extra intensive boosts of nourishment throughout the year, especially as we age. This Intensive Treatment is just the thing for targeting skin that has lost some of its youthful glow. Applying both morning and evening it allows the skin to heal overnight as it won’t block pores; and balances and protects ageing skin during the day, helping reduce wrinkles and dryness. With a rich list of ingredients including Madonna Lily, Gingko and Hawthorn, plus gemstones Blue Tourmaline, Amber and Gold to aid regeneration, skin will be left beautifully radiant and healthy. This Intensive Treatment is designed to be used in conjunction with your daily skin care routine. Continue to cleanse, tone and moisturise daily. Application: After cleansing your face in the morning and evening apply 4-5 pumps of Regenerating Intensive Treatment evenly to face, neck and décolleté. Use this product over a 28-day period as skin cells are renewed every 28-days. One bottle should provide 1x 28-day course. Tip: It is recommended to use Regenerating Intensive Treatment four times per year to gain the most benefit. Matching Products: In addition, we recommend an ‘Intensive’ skincare routine once or twice a week with Clarifying Steam Bath, Clarifying Clay Mask and Firming Mask. Ingredients: Water (Aqua), Santalum Album (Sandalwood) Wood Water, Mineral Salts, Fragrance (Parfum)*, Lilium Candidum Bulb Extract1, Ginkgo Biloba Leaf Extract1, Olea Europaea (Olive) Leaf Extract1, Crataegus Monogyna Leaf/Fruit Extract1, Althaea Officinalis Leaf Extract1, Gold1, Amber Powder1, Tourmaline1, Royal Jelly1, Honey (Mel)1, Glycerin, Alcohol, Lactose.Water (Aqua), Santalum Album (Sandalwood) Wood Water, Mineral Salts, Fragrance (Parfum)*, Lilium Candidum Bulb Extract1, Ginkgo Biloba Leaf Extract1, Olea Europaea (Olive) Leaf Extract1, Crataegus Monogyna Leaf/Fruit Extract1, Althaea Officinalis Leaf Extract1, Gold1, Amber Powder1, Tourmaline1, Royal Jelly1, Honey (Mel)1, Glycerin, Alcohol, Lactose.Water (Aqua), Santalum Album (Sandalwood) Wood Water, Mineral Salts, Fragrance (Parfum)*, Lilium Candidum Bulb Extract1, Ginkgo Biloba Leaf Extract1, Olea Europaea (Olive) Leaf Extract1, Crataegus Monogyna Leaf/Fruit Extract1, Althaea Officinalis Leaf Extract1, Gold1, Amber Powder1, Tourmaline1, Royal Jelly1, Honey (Mel)1, Glycerin, Alcohol, Lactose.Water (Aqua), Santalum Album (Sandalwood) Wood Water, Mineral Salts, Fragrance (Parfum)*, Lilium Candidum Bulb Extract1, Ginkgo Biloba Leaf Extract1, Olea Europaea (Olive) Leaf Extract1, Crataegus Monogyna Leaf/Fruit Extract1, Althaea Officinalis Leaf Extract1, Gold1, Amber Powder1, Tourmaline1, Royal Jelly1, Honey (Mel)1, Glycerin, Alcohol, Lactose.Water (Aqua), Santalum Album (Sandalwood) Wood Water, Mineral Salts, Fragrance (Parfum)*, Lilium Candidum Bulb Extract1, Ginkgo Biloba Leaf Extract1, Olea Europaea (Olive) Leaf Extract1, Crataegus Monogyna Leaf/Fruit Extract1, Althaea Officinalis Leaf Extract1, Gold1, Amber Powder1, Tourmaline1, Royal Jelly1, Honey (Mel)1, Glycerin, Alcohol, Lactose.Water (Aqua), Santalum Album (Sandalwood) Wood Water, Mineral Salts, Fragrance (Parfum)*, Lilium Candidum Bulb Extract1, Ginkgo Biloba Leaf Extract1, Olea Europaea (Olive) Leaf Extract1, Crataegus Monogyna Leaf/Fruit Extract1, Althaea Officinalis Leaf Extract1, Gold1, Amber Powder1, Tourmaline1, Royal Jelly1, Honey (Mel)1, Glycerin, Alcohol, Lactose.Water (Aqua), Santalum Album (Sandalwood) Wood Water, Mineral Salts, Fragrance (Parfum)*, Lilium Candidum Bulb Extract1, Ginkgo Biloba Leaf Extract1, Olea Europaea (Olive) Leaf Extract1, Crataegus Monogyna Leaf/Fruit Extract1, Althaea Officinalis Leaf Extract1, Gold1, Amber Powder1, Tourmaline1, Royal Jelly1, Honey (Mel)1, Glycerin, Alcohol, Lactose.